This weekend the Midwest was hit with a cold front which dipped our highs into the 70's creating all the feelings of fall in my household. 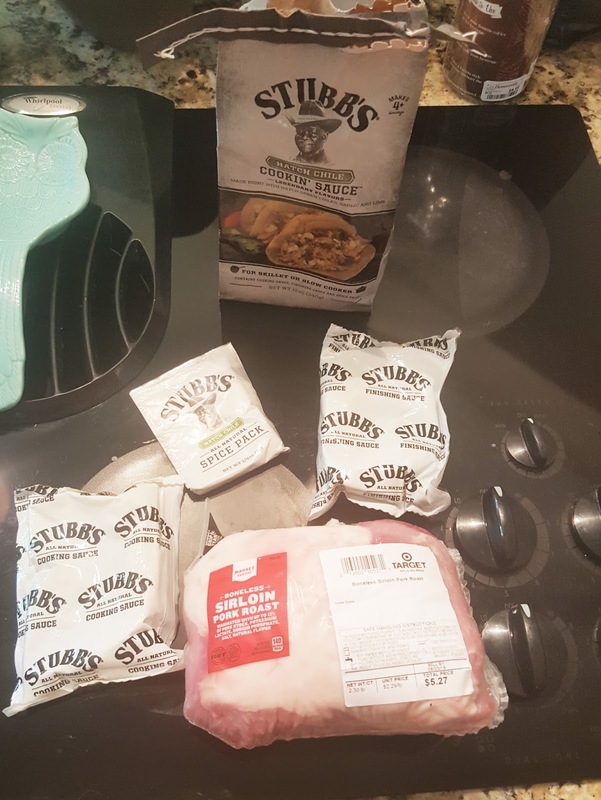 I love to make crockpot meals in the fall and winter and while at the grocery store this weekend, I decided to make some Hatch Green Chile Pork in the crockpot when I came across a new kit I had never seen before by Stubbs. The kit is actually for chicken but the husband and I prefer our green chile with pork so we swapped the meats. The kit comes with a dry rub, a cooking sauce, and a finishing sauce. You can use it to cook on the stovetop or in the crockpot but we opted for the crockpot method. We cooked our pork roast about 7 hours and it was very tender to shred. It would be great to serve the meat on sandwiches or a salad but we opted for soft tacos. Using Mission Low Carb Tortillas, I stuffed mine with pork, pepper jack cheese, sour cream, and salsa. If I had some avocado, I definitely would have made some guac to go along with it. The flavor was excellent. We were a little worried because our roast was bigger than what the seasoning kit called for but no worries, very well flavored and even had a little heat. We noticed there were a few other flavor kits that we may have to check out next time.